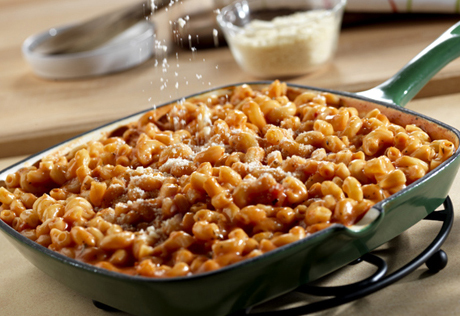 Elbow macaroni is dressed with a cheesy tomato sauce for this stove-top version of macaroni and cheese. Best of all, it's ready in just 25 minutes. Heat the soup, sauce, milk and pasta in a 3-quart saucepan over medium heat until the mixture is hot and bubbling, stirring occasionally. Serve with the cheese.